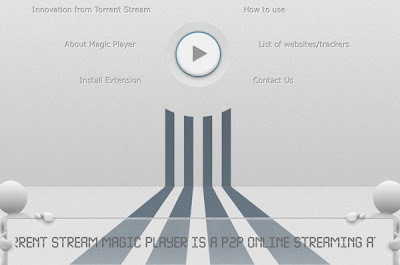 Thanks to improvements in Internet connections, users are going to be able to download content via streaming them directly, and furthermore, some customers are incorporating features BitTorrent streaming video and audio. Well, for video playback and streaming audio files on the BitTorrent protocol and we will need only a web browser and Magic Stream Torrent Player. It is of service than through a browser extension available for Firefox, Chrome and Opera, and still in early stage of development, enables browsers to be able to play via streaming contents. torrent files, both video and audio, trackers of the most important. Thus, in the context menu of our browser we will find the option to reproduce the contents through the links. torrent, even if we take into account that we only work if we are under Windows. In the future more options will be added and improvements in thedevelopment , and in any case, those who try it should be noted that the displayed contents are also stored locally, so you should proceed to manually remove such content.